Barbara Koob (now officially known as “Cope”) was born on January 23, 1838 in Heppenheim, Germany. A year later, her family moved to the United States. 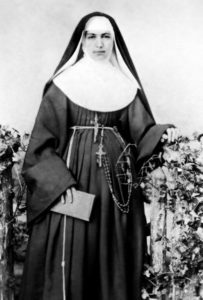 In the summer of 1862 at age 24, Barbara entered the Sisters of St Francis in Syracuse, N.Y. and on November 19, 1862 she received the religious habit and the name “Sr Marianne”. The following year she made her religious profession and began serving as a teacher and principal in several elementary schools in New York State. Although she joined the Order in Syracuse with the intention of teaching, such was not the case with a series of administrative appointments. As a member of the governing boards of her Religious Community in the 1860s, she participated in the establishment of two of the first hospitals in the central New York area. These hospitals were open to caring for the sick without distinction as to a person’s nationality, religion or color and were among the first 50 general hospitals in the entire U.S. Sister Marianne served as administrator at St. Joseph’s Hospital in Syracuse, N.Y. in 1870 as head administrator for six of the hospital’s first seven years. Her unique leadership in health care was a result of her unique abilities and talents. An intelligent and charismatic facilitator, there was never a challenge too big for her. Mother Marianne became well-known and loved in the central New York area for her kindness, wisdom and down-to-earth practicality and was often criticized for accepting treatment of what was seen as “outcast” patients such as alcoholics. In 1883, as the Provincial Mother in Syracuse, she received a letter from a Catholic priest asking for help in managing hospitals and schools in the Hawaiian Islands-mainly to work with leprosy patients. Being who she was, how could she not be touched by such a request? She responded: “I am hungry for the work and I wish with all my heart to be one of the chosen ones, whose privilege it will be to sacrifice themselves for the salvation of the souls of the poor Islanders…. I am not afraid of any disease, hence, it would be my greatest delight even to minister to the abandoned “lepers'”. She and six other Sisters of St Francis were chosen out of 35 volunteers and they arrived in Honolulu in November 1883. 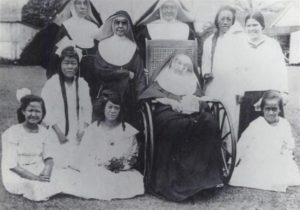 With Mother Marianne as supervisor, their main task was to manage the Kaka’ako Branch Hospital on Oahu, which served as a receiving station for patients with Hansen’s disease (leprosy) gathered from Hawaiian islands. By 1885, they had made major improvements to the living conditions and treatment of the patients. In November 1885, they founded the Kapi’olani Home inside the hospital compound, to care for the healthy daughters of Hansen’s disease patients at Kaka’ako and Kalawao. The unusual decision to open a home for healthy children on leprosy hospital premises was made because only the Sisters would care for those so closely related to people with the dreaded disease. Mother Marianne met Fr Damien de Veuster for the first time in January 1884, when he was in apparent good health. Two years later, in 1886, after he had been diagnosed with Hansen’s disease, Mother Marianne alone gave hospitality to the outcast priest upon hearing that his illness made him an unwelcome visitor to Church and Government leaders in Honolulu. In a turn of events in 1887, when a new Government took charge in Hawaii, its officials decided to close the Oahu Hospital and receiving station-reinforcing the former alienation policy. This meant that those afflicted with the disease would be sent to a settlement for exiles on the Kalaupapa Peninsula on the island of Molokai with no provision of care. In 1888, Mother Marianne again responded to this need and said: “We will cheerfully accept the work…”. 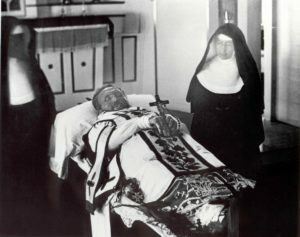 She arrived with Sr Leopoldina Burns and Sr Vincentia McCormick in Kalaupapa several months before Fr Damien’s death and was able to console the ailing priest by assuring him that she would provide care for the patients at the Boys’ Home at Kalawao that he had founded. Mother Marianne also provided healthcare to the girls in her care at Bishop Home in Kalaupapa, that included healing for mind, body and spirit by creating a community that supported individual creativity, dignity and respect. A community of family was established enhanced by gardens, music, art, games and laughter. Mother Marianne never returned to Syracuse, NY. She died of natural causes in Kalaupapa on August 9, 1918 and was buried on the grounds of Bishop Home. In January, 2005, her body was exhumed and sent to Syracuse, NY. She was beatified on May 14, 2005 and canonized on October 21, 2012. In July 2014, her remains were brought back to Hawaii and is enshrined at the Cathedral Basilica of Our Lady of Peace in Honolulu. 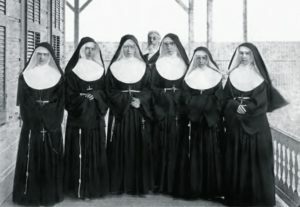 The Sisters of St. Francis began collecting materials soon after Mother Marianne’s death for her eventual canonization. October 24, 2003, theologians, cardinals and bishops at the Congregation for the Causes of Saints declared her heroically virtuous. April 19, 2004, Pope John Paul II issued the decree officially naming her Venerable. December 20, 2004, after receiving the unanimous affirmation of the Congregation for the Causes of Saints, Pope John Paul II ordered a decree to be issued authenticating a miracle attributed to Mother Marianne’s intercession. May 14, 2005, Venerable Marianne Cope was beatified. Another verified miracle happening after her status of Blessed would lead to her canonization. June 16, 2011, Vatican Medical Board rules unanimously that a second miracle case is an inexplicable medical recovery. 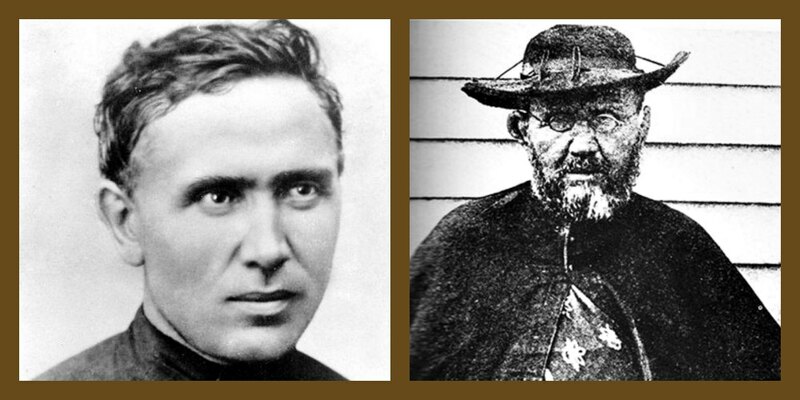 October 8, 2011, theologians rule unanimously that the second miracle case was due to the intercession of Blessed Marianne Cope. December 6, 2011, the Congregation for Causes of Saints affirms Blessed Marianne for canonization. 2011, Pope Benedict XVI affirms Blessed Marianne for canonization. October 21, 2012, canonization of Mother Marianne Cope.